With more than 38 million passengers expected to fly on U.S. airlines this holiday season, the forecast calls for full planes, busy terminals and cranky travelers. But airports are doing what they can to ease the strain, offering roving Santas, entertaining elves, live music and even free gifts and prizes. Probably the king of airport holiday promotions this week is at JFK International Airport’s Terminal 7, where travelers whose flights are delayed can win prizes through the “Delight my Delay” campaign. Even better, winners get double the prizes, so they can share their good fortune with a friend or “pay it forward” to another delayed traveler. Travelers passing through other airports may not strike it rich, but they can enjoy other holiday perks. In Chicago, where 4.6 million travelers are expected over the holidays, free hot cocoa will be served at Midway Airport while O’Hare Airport will be hosting a holiday photo booth with plenty of props. At the Dallas/Fort Worth International Airport, complimentary Dunkin’ Donuts gift cards will be given out to travelers in the parking lots and terminals and complimentary Starbucks gift cards will be given to airport valet customers (both while supplies last). At Seattle Tacoma International Airport, Frosty the Snowman, elves, fairies and other costumed characters are roving the terminals to spread cheer. 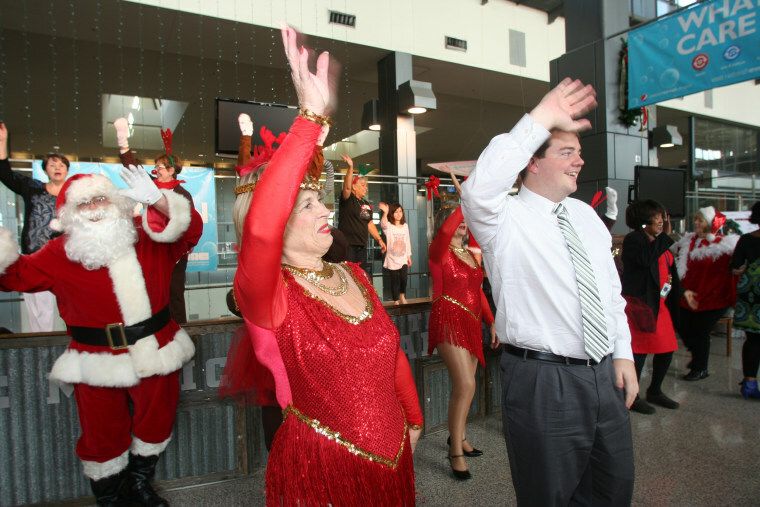 And, if you hurry, you can catch dancing Santas and reindeer from the Judy Lee Dancers (average age: 60+) on Tuesday at Austin-Bergstrom International Airport. At Denver International Airport, which is expecting above-average passenger traffic, through January 4, those waiting for arriving passengers can listen to live music and relax in in lounge seating and cabaret tables in the center of the Great Hall. And, to supplement the pet therapy dogs on duty at many airports year round, United Airlines is bringing extra teams of professionally trained comfort dogs to minister to stressed fliers at Chicago, Cleveland, Denver, Houston, Los Angeles, Newark and Washington, D.C., airports. The United Paws pooches will be on duty each day through Dec. 23 between 9 a.m. and noon and 1 and 4 p.m.